"Government says it is nationalist. I want to ask the government if it is nationalist then it should respect the fallen soldiers, whether they are Hindus or Muslims. If it is nationalist, it should stop disrespecting the freedom fighters who have laid the foundation of this country," Priyanka said while sharing the stage with Congress president Rahul Gandhi and general secretary Jyotiraditya Scindia at a public rally here. "If it is nationalist, why didn't the government meet and listened to the farmers who came barefoot from different parts of India? If it is nationalist, then when people were killed in the name of religion why didn't it share the grief of the victims, instead of honouring the victims' murderers? If it is nationalist, why is it afraid of people raising their voice?" 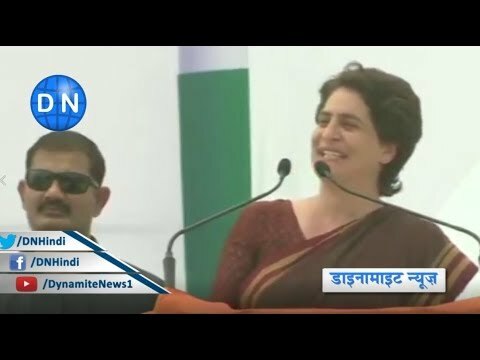 Priyanka said while directing her attack on the BJP which is leading the NDA government at the Centre. "It feels as if this government is neither proud of democracy nor our institutes nor people of the country. If it is a real nationalist then it would have been on the path of truth. But, it drifted away from it long ago", she added. Priyanka, who attacked BJP by accusing it of running fake campaigns, said, "I have realised the truth of this so-called development which is being heavily advertised by the government. People know the farce of these advertisements. But whenever people raise questions, they are called anti-national."